At the core of Orlando Chamber Choir's summer programme are three magnificent Bach motets. Komm, Jesu, komm is a musical dialogue between two choirs who, in eight intrinsically interwoven parts, produce an intimate and touching contrapuntal word painting. In Der Geist hilft unser Schwachheit auf, which commemorates the headmaster of the school where Bach was a teacher, a four-part double fugue culminates in a setting of a Luther chorale. Centrepiece of the programme is the extraordinary motet Singet dem Herrn which Bach wrote to teach his pupils composition and performance technique. The work ranges from exciting homophony to fabulous four and eight-part fugues set to biblical texts and contemporary poetry. When Mozart heard the motet in 1789 he exclaimed "That is really something from which one can learn a great deal!". 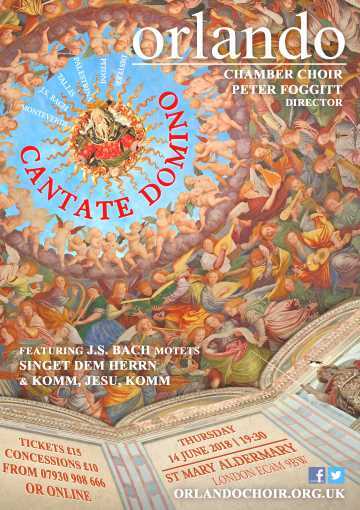 Tracing the origins of the words Singet dem Herrn, the programme includes the chanted psalm text Cantate Domino, a setting by Pitoni and a joyous madrigalian version by Monteverdi which sings unto the Lord in earthlier tones. Distler’s 1934 interpretation of Singet dem Herrn builds on the style of Bach and Schütz with a composition full of syncopations and bold harmonic contrasts. Tallis's exquisite Loquebantur variis linguis proposes an alternative way to voice the Lord's praises. Written for a joint performance by Mary Tudor's Chapel Royal and the Capilla Flamenca of her Spanish husband Philip II, the seven-part composition mimics the mesmerising sound of multilingual tongues conversing about God's wonders. Palestrina sets the text Dum complerentur dies Pentecostes which describes how heaven can even be heard in the sound of the wind – and concludes with a jubilant six-part Alleluia.